Obsidian knocked it out of the park with original Pillars of Eternity in all departments. Since then, fans have been clamoring for a sequel and it has finally arrived in the shape of Pillars of Eternity 2 Deadfire. This entry improves on everything that was good about the first one, and makes it even more memorable experience. The characters are better written, the dungeons are all unique, and each quest has its own charm. The world of the Deadfire is based on different islands and going to each island for the first is an amazing feeling every single time. You have to go through all of them in this 40-50 hour adventure, and not a single minute of it is boring. There’s always something going on, which keeps you on the edge of your throughout your journey. The storyline in Pillars of Eternity 2 Deadfire is done on a grand scale. It takes some time to get going, but that isn’t bothersome at all. You engage in a ton of excellent quests in this story that you can completely ignore the overarching storyline until the very end. The quests you embark on are written really well, and there are always surprises. You may think that a certain mission will play in a certain way, but it doesn’t. This kind of experience keeps you engaged in the story and the characters involved. One important thing to note though is that your choices matter. There is no right or wrong choices in the game, but do know that whatever decisions you make will benefit one side, and will harm the other. Adding this kind of decision into the mix makes the whole experience much better. You have to take into account that siding with one side would mean war with the other. As mentioned above, there aren’t any wrong decisions in the game, but helping one would affect the other, and that’s where the game and its quests shine the brightest. For RPG fans, decisions like this matters a lot as you want your decisions to impact the events of the storyline, and that is exactly what Deadfire delivers. The gameplay still revolves around the typical strategies, but this time, they have added a new feature that allows you to pre-determine some of your party moves. Instead of guiding your companions through same moves in every fight, you can fine-tune them to tackle certain enemies in a certain way. It works very similar to Final Fantasy XII’s system. It is not extremely reliable, but it works in most scenarios, which is a huge benefit. It can save you a ton of time during some minor fights as your friends will take care of the enemy forces in a matter of seconds. The strategy aspect of the game is once again implemented really well as you have to learn the strengths and weaknesses of your opponents before you can take them down. This doubles down for the boss fights as they can be quite technical sometimes and require a ton of thinking on your part. You have to understand what they are doing in order to beat them. You can’t just keep pressing Mouse 1 and hope that things will work out. The players of original will feel right at home with the combat as it is very similar. However, those of you who are new to the series will face some trouble early on. The battle system is complex and you have to learn a lot of things, so reading tutorials will be a major part of your initial hours. Make sure to grasp all the concepts before you delve deeper into the adventure. Pillars of Eternity 2 Deadfire is an amazing game. It’s not only a good sequel, but it is also a great addition to the RPG genre. From the story to the voiceovers to the quest structure to the decision making to the visuals – everything is absolute top notch. Obsidian has a great track record when it comes to delivering great storylines and this one isn’t any different. With this new entry, you are looking at over 50 hour of storyline that is filled with some amazing characters, drama, quests, and dungeons. You will have a ton to do and ton to figure out. Furthermore, due to decisions having an impact on the story, it is almost certain that you’d want to replay it. Second play through with different decisions would alter the entire storyline hence making it a different experience altogether. 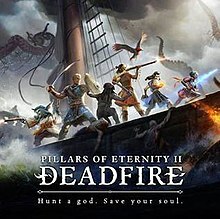 So, the bottom line is, if you like RPGs, then you absolutely need to play Pillars of Eternity 2 Deadfire.